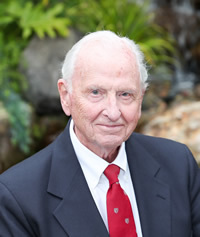 Dr. Barrie Fairley joined the TGH Anesthesia department from London in 1955, and left in 1968. He was subsequently professor and vice-chair at the University of California in San Francisco, and then chair of the department at Stanford University. He started the TGH Respiratory (Care) Unit in 1958 with three colleagues: Richard Chambers (neurology), Colin Woolf (pulmonology), and Hugh Barber (ENT), – becoming its first director. Among other programs that he initiated at TGH were clinical blood gas measurement, the hospital’s code blue team, the region’s first critical care transports, and hyperbaric medicine.